Within newly created Open Area 26 (Figure 43), two buildings are judged to be present in Period 2B. 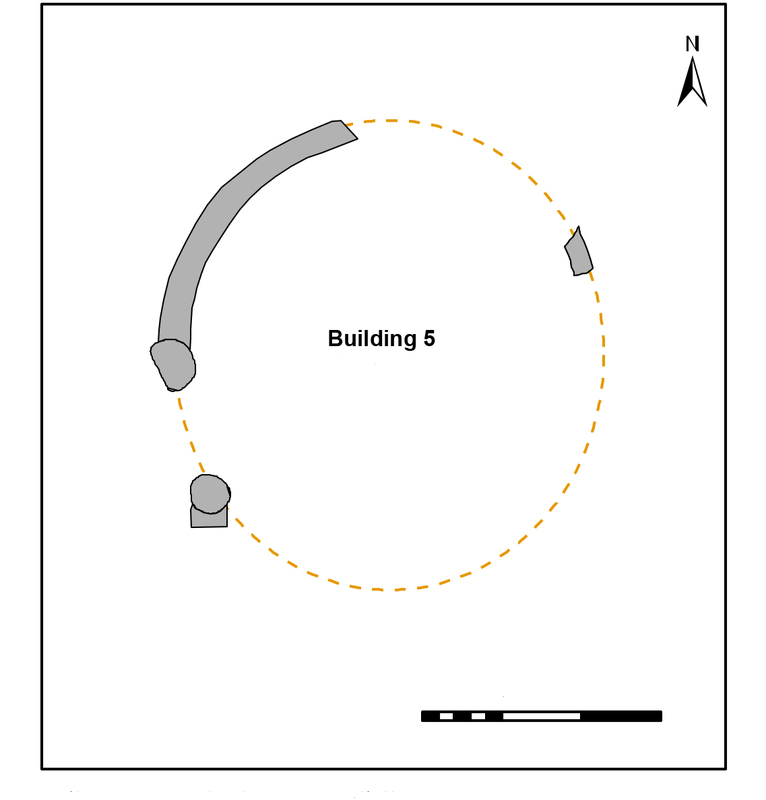 The one to the north, Building 5, is round in plan while the southern, Building 30, is rectilinear and is not aligned on the enclosure boundaries. The OA26 interior is evidently subdivided, with three sub-enclosures (A, B, C) set out to the south of the buildings. The buildings themselves are judged to occupy a larger subdivision (D), though the possibility of its further subdivision cannot be discounted. 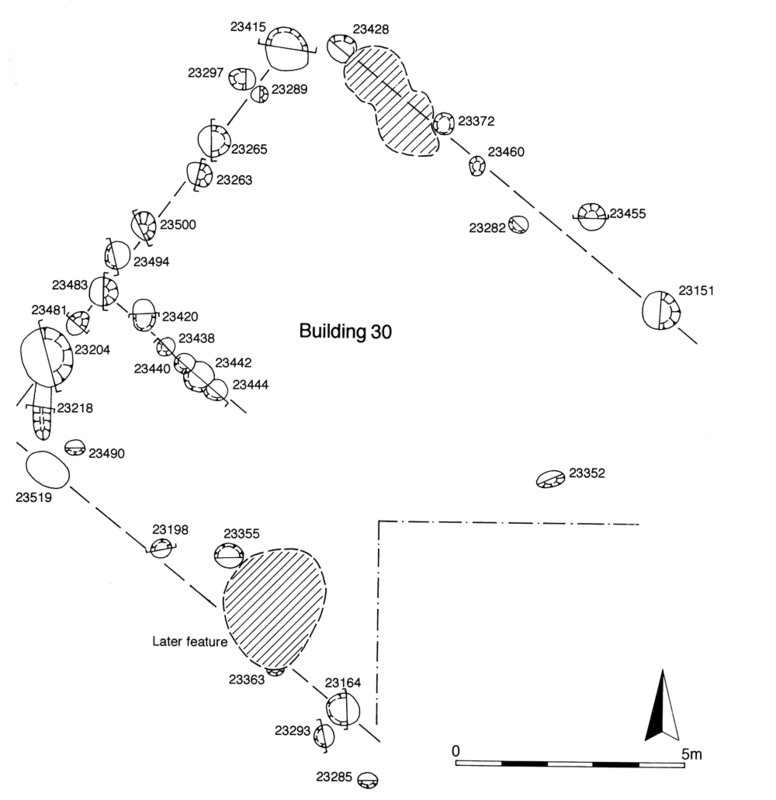 Building 30 may be associated with sub-enclosure B, at whose northern end it sat, and less certainly, Building 35 with sub-enclosure C.
A similar pattern of subdivision is noted to occur within adjacent southern zone enclosure (Open Area 25). Building 5 is denoted by curving gully 25083 (segs 24201, 24209, 24275, 24277, 24285, 24287), which describe roughly the northern half of the foundation slot of a circular structure of almost 6m diameter (c. 28m² area) (Figure 44). The south half of the building is truncated by later pitting. On the western side of the building, gully terminals associated with a pair of post-holes (24277, 24285) flank a 1m wide gap in the gully line and presumably mark the position of a doorway. The single gully fill contains a small quantity of Late Iron Age pottery, while post-hole 24285 includes a few sherds of early Roman pottery. Together these probably indicate a date towards the mid-1st century AD, most probably for the disuse of the building. It remains possible that this is a slightly earlier structure (reminiscent of Period 2A Building 4), which was perhaps retained. Building 30 is a rectilinear structure (Group 230) tentatively extracted from a mass of excavated post-holes recorded within Excavation Area N. Only the north-west wall of the building is reliably defined, formed by a line of ten closely spaced post-holes, including larger corner posts at either end. The evidence for its north-east and south-west walls is far less coherent and the south-east wall remains undefined. A building measuring 8m by 7.5m may be suggested (Figure 45). Various post-holes within this building could be construed to constitute the remains of internal walls (in particular 23420, 23438, 23440, 23442 and 23444). As is usual for early structural features on this site, there is no direct evidence of function or clear indication of date for either construction or disuse. The small quantities of pottery recovered are mainly grog-tempered, which, in association with Roman wares, may provide an early to mid-1st century date. However, the nature of this assemblage is unclear, and it is uncertain whether it derives from the construction or destruction of the building (or a mixture of both). The sherd of BB1 in post-hole 23483 (which would push the date into the later 1st or early 2nd centuries AD) may be intrusive. The alignment and shape of this building are atypical. 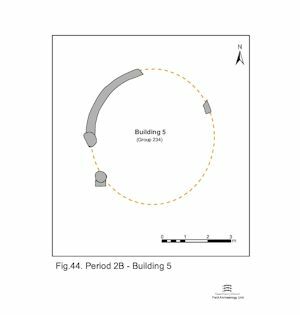 It is orientated skew to the alignment of the contemporary enclosure system in the vicinity, and seems to be almost square in plan, which contrasts with the round or rectilinear/strip buildings seen elsewhere across the settlement at this period. It should, however, be noted that the number of undated post-holes in this part of the site means that alternative interpretations of the building's layout are entirely possible. 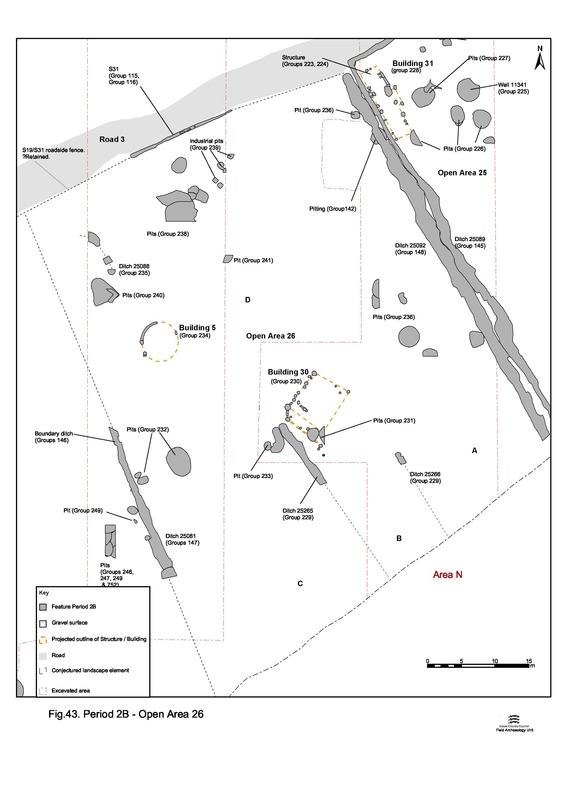 It is worth noting that Building 5 (like Building 4, Period 2A) occupies a distinctly clear zone between clusters of contemporary pits to its north and south. The southern part of OA26 appears to be subdivided. Ditch 25266 (seg. 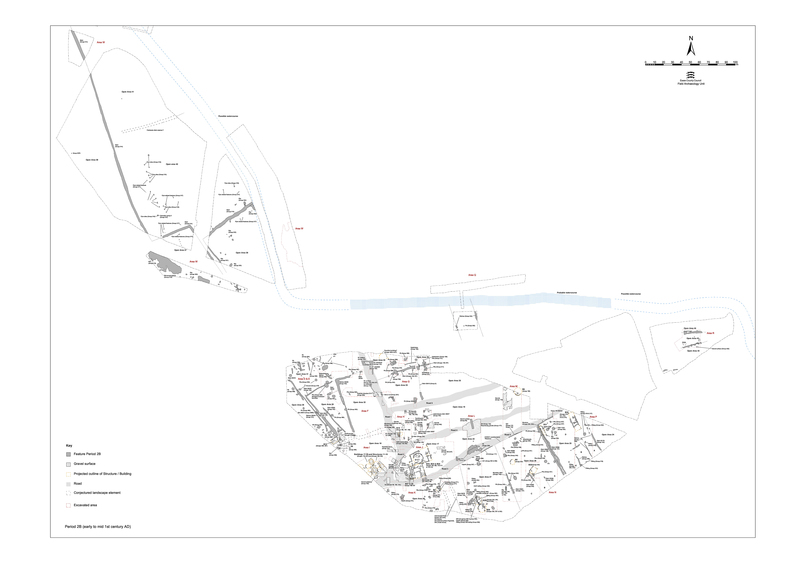 11516 Group 229) runs parallel to the enclosure boundaries and can be traced for c. 15m, from a northern terminal to the southern limit of excavation. It is of similar dimensions to enclosure boundary ditch 25089 to its east and marks a central subdivision of the southern part of OA26. On the grounds of its similarities and alignment with the adjacent boundary features, it must be regarded as an element of the mid-1st century AD landscape. The small quantity of mid- to late Roman pottery in its fill is either intrusive or indicative of prolonged accumulation within the hollow of a long-lasting boundary. Ditch 25265 (seg. 23209 Group 229) is located to the west of 25266 and may define a further subdivision of the rear of the enclosure. The terminal fragment of an adjacent, but curving, ditch (seg. 23175) may suggest further complexity. It could constitute a forerunner of 23209, but there is sufficient overlap in the ceramic date ranges of both to allow them to be in use at the same time during the earlier 1st century AD. 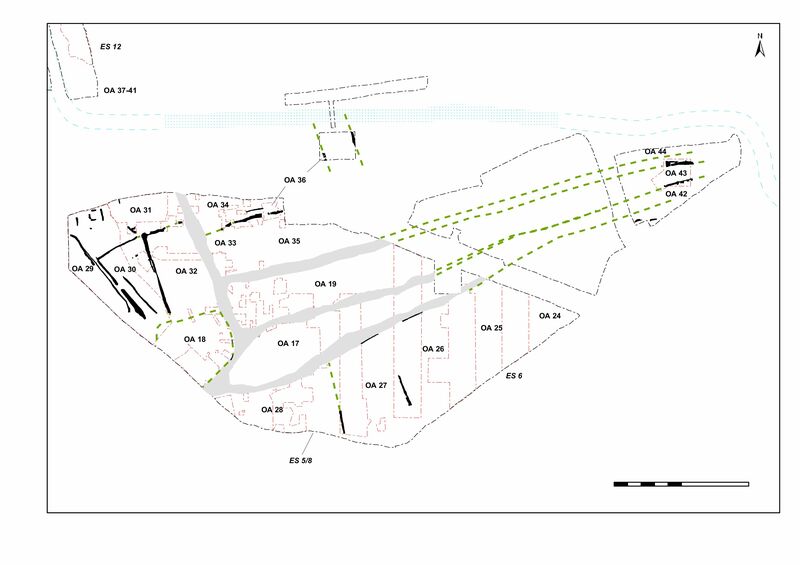 Neither ditch can be observed to continue further north, and the subdivision of the enclosure seems only to extend to that part of OA26 to the south of proposed Building 30. 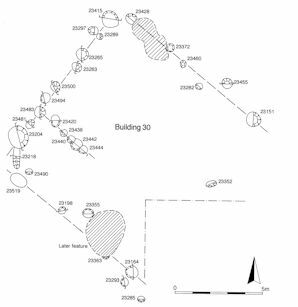 No Period 2B pitting is apparent within the excavated areas of sub-enclosures A and B, but is present in sub-enclosure C. Pits 24134, 24151, 24153 (Group 232), which are quite close together, are largely of firmly Late Iron Age, rather than transitional, dates. A large pit, 24134 (c. 4m N-S), contains the most varied of the finds assemblages, but overall finds from these pits are sparse. Pit 23424 (Group 233), is positioned close to subdivision ditch(es) 25266, and is more likely to be of a transitional, mid-1st century, rather than purely pre-conquest, date, as it contains small quantities of ceramic building materials in its upper fills. Pits on the eastern side of sub-enclosure D (11148, 23005, 23023, 23059, 23084, 23124 Group 236) appear to continue to fill into the middle of the 1st century AD - Late Iron Age grog-tempered pottery is predominant within these assemblages, but with small quantities of Roman wares present in the upper fills. These largely contain pottery, daub, baked clay and briquetage, but pits 11148, 23023, 23084, 23124 also include small quantities of ceramic building materials, almost invariably from upper fills. As noted above, this suggests a transitional mid-1st century, rather than purely pre-conquest, date. It is also worth noting that several show a marked progression in the nature of the pottery in different fills from pre-conquest to transitional assemblages. Pit 23005 includes loomweight fragments and spindlewhorls, while pit 23124 also has loomweight fragments, along with a glass bead and a Knotenfibel brooch. The siting of these pits, particularly the larger examples, to the east of Building 30, reinforces the impression that the enclosure is subdivided, with a clear distinction between occupation and rubbish disposal areas. A few of the transitional, mid-1st century, pits could be seen as belonging in Period 3 but they appear to fit better within the Late Iron Age patterning than the early Roman. 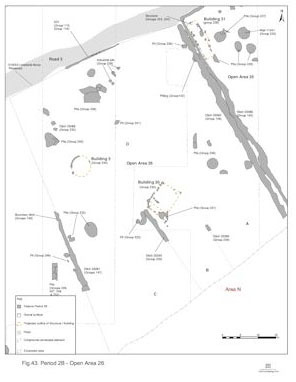 A cluster of pits (Group 238 15392, 15588, 15591, 15593, 15594, 15596, 15815) in the north centre of the enclosure (technically in sub-enclosure D), close to the Road/track 3 edge, are a mixed set, in terms of both date and size, with distinct groups of both Late Iron Age and transitional date evident among the features excavated. The earliest pits include 15596 and 15815, of early/mid-1st century AD date, which contain very few finds. A much greater diversity and quantity of find types is noted in those of transitional date. One exceptional aspect of the largest pit, 15594, is the inclusion of two brooches (SFs 7410, 7421) within it. Some (particularly 15588, 15591, 15593, 15594) may cluster around the Period 2A pyre-debris pit 15417 and the concentration of pitting appears to respect this earlier feature. Within this cluster, the pits divide into two general types - large and rounded or small and square - but all contain similar artefact assemblages dominated by pottery. A distinct group of smaller square pits, 15289, 15306, 15309, 15385 (Group 239), clusters in the north part of OA26, within c. 10m of the edge of Road 3. These are c. 0.75m to 0.9m wide, nearly square, and do not exceed 0.4m in depth. All contain above average amounts (especially considering their small volumes) of metalwork debris or metal objects, both iron and copper alloy, along with slag, hammerscale and at least one mould fragment. These pits therefore seem to be used for the disposal of waste from metalworking in the vicinity. These features are very similar to pits in OA25 and their stratigraphic position indicates that they are probably earlier to mid-1st century AD in date. Undated pit 24427 (Group 241) may also be contemporary with this phase of activity in OA26. A final pit, 11723 (Group 142), is of some significance. Lying on the eastern boundary of the enclosure, it apparently pre-dates a modification to the eastern boundary of the enclosure (see 'Southern zone, Open Area 27'). It contains a well-dated pottery assemblage (KPG14) of c. AD 45-55), though the presence of samian sherds dated to AD 60-80 is noted (this may be intrusion/contamination from subsequent ditch re-cuts).